Enjoyment slice by slice - is guaranteed with this exceptional Laguiole invention. It meets any need of salami lovers, because it can be used for storage and as a perfect shaped cutting block. In the box your air dried salami may ripen further, whereas a perfect climate is provided by screened air holes. Open the sliding cover, take out the salami and slice it comfortably in the designated groove. Enjoy already the cutting of your salami with the precisely serrated Laguiole carving knife. - A precious knife from the French cutlery manufacturer Claude Dozorme at Thiers. Forged from one piece of top quality steel and shiny polished, for highest comfort. and exceptional surface feel and visual appearance. - Purfled with the bee as the typical Laguiole design element. - A pleasure for all senses. 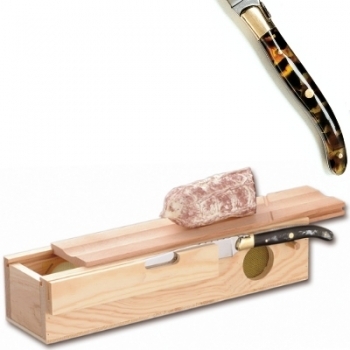 - Laguiole salami box with knife - Available in 10 different handle variations.